The Rise and Fall of a Dynasty – Ducketts of Duckett’s Grove. The Duckett ancestry can be traced back to Richard Duckett, Lord of the Manor of Fillingham, Lincolnshire, England in 1205, who was Judge of the counties of Bedford, Buckingham, Cambridge, Huntington, Norfolk, Northampton and Rutland in the reign of Henry III. They were a very famous family in Great Britain being descended from the Norman and Palntagenet Kings and lineally descendants of William the Conqueror and of King Edward I. Sir George Duckett was the first of the Ducketts to arrive in Ireland. He was one of many English landlords who travelled to Ireland during the Cromwellian period of the 1650’s. This was a very turbulent time in Irish history, with frequent battles between the native Irish and the English invaders. In 1377 James Duckett acquired Garyrigg Estate through his marriage to Margaret de Windsore. In 1695 Thomas Duckett (1) purchased five hundred acres of land in Kneestown, Palatine, Co. Carlow from British landlord Thomas Crosthwaite from Cockermouth near the Lake District in Scotland. Thomas Crosthwaite owned a vast amount of land in Ireland during that period. However, Thomas Duckett (1) did not make use of this land until the 1700’s when he built a mansion house on a site replacing a smaller house on or close to where the ruins of Duckett’s Grove now stands. In the early years of the Ducketts story, inter-marriage with some well-connected and wealthy families contributed greatly to their financial standing and allowed for the expansion of the Demesne. Thomas Duckett’s (1) wife, Judith de la Poer was the heiress of the wealthy Pierce De La Poer of Killowen in County Waterford, grandson of the Hononary Pierce De la Poer, of Killowen, Brother of Richard, First Earl of Tyrone. Thomas Duckett (1) had only one son, also named Thomas (2) who was his successor and heir. The Duckett family extended their estate, and their wealth grew throughout the eighteenth century. The only son from this marriage Thomas Duckett (2) (a member of the Religious Society of Friends, commonly known as Quakers) lived in Phillipstown, Rathvilly, Co. Carlow, a property purchased from the Earl of Ormonde. His last will and testament was dated 18th January 1732 and was proved on 13th May 1735. 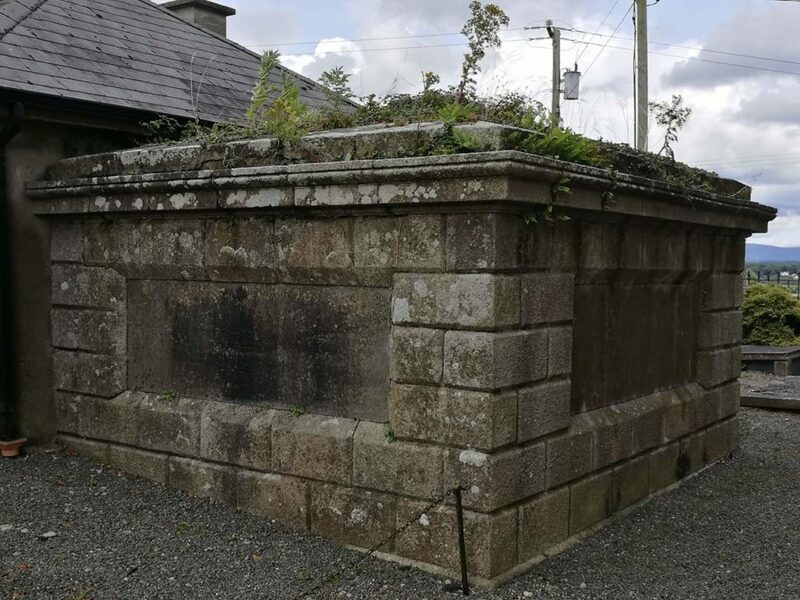 Thomas Duckett (2) had three daughters and one son and heir; John Duckett Esq., (1) of Philipstown, Rathvilly, Co. Carlow and Newtown, Co. Kildare, whose last will and testament dated 13th April 1733, was proved on 17th May 1738. John Duckett Esq., (1) married Jane Devonsher who was daughter of Thomas Devonsher Esq. from Cork. The first son of John Duckett Esq., (1) and Jane Devonsher was Thomas Duckett (3) of Newtown died unmarried. Their second son William Duckett (1) of Philipstown, Co. Carlow married Janet Summers, daughter of Samuel Summers, Esq., and they had no children. Their third son, Abraham Duckett (1) of Ardnahue, Co. Carlow married Mary Jessop, daughter of Samuel Jessop, Esq., Abraham Duckett (1) and Mary Jessop had four sons (three sons, who all died without children) and three daughters. Their fourth son, Jonas Duckett Esq. of Co. Carlow (who Duckett’s Grove is said to have been named after) whose last will and testament dated 7th July 1796, was proved 21 December 1798 married Hannah Alloway, daughter of William Alloway, Esq. of Dublin had four sons, their eldest son and heir being William Duckett Esq., (2) of Duckett’s Grove. In 1790 William Duckett Esq., (2) married Elizabeth Dawson, daughter and co-heir of John- Dawson Coates Esq, a banker of Dawson Court, Co. Dublin. This was the turning point of the fortunes and wealth of the Ducketts and the expansion of the Duckett dynasty. William Duckett (2) and Elizabeth Dawson Coates. Their first son and heir John Dawson Duckett (1), inherited Duckett’s Grove. Their second son, William Dawson Duckett (1), it was for him that nearby Russelstown Park was built for in 1824. William Dawson Duckett (1). His other sons were Joseph-Fade, Thomas –Jonas who died unmarried. They also had two daughters, Elizabeth who died young, and Elizabeth Dawson married William –Richard Steuart Esq of Steuart’s Lodge, Co. Carlow, who was High-Sheriff in 1820. 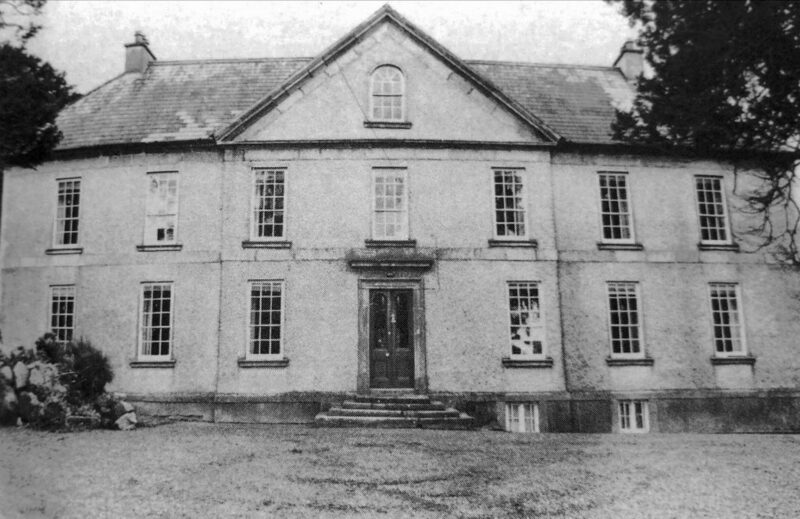 Photo: Russelstown Park House, demolised by the Land Commission in the 1950’s. John Dawson Duckett (1) – heir of Duckett’s Grove and his wife Sarah Summers had two sons, William (Dawson) Duckett (2) – (14th April 1822 – 22nd June 1908), the eldest, was named after his uncle and he was the last heir to Duckett’s Grove. 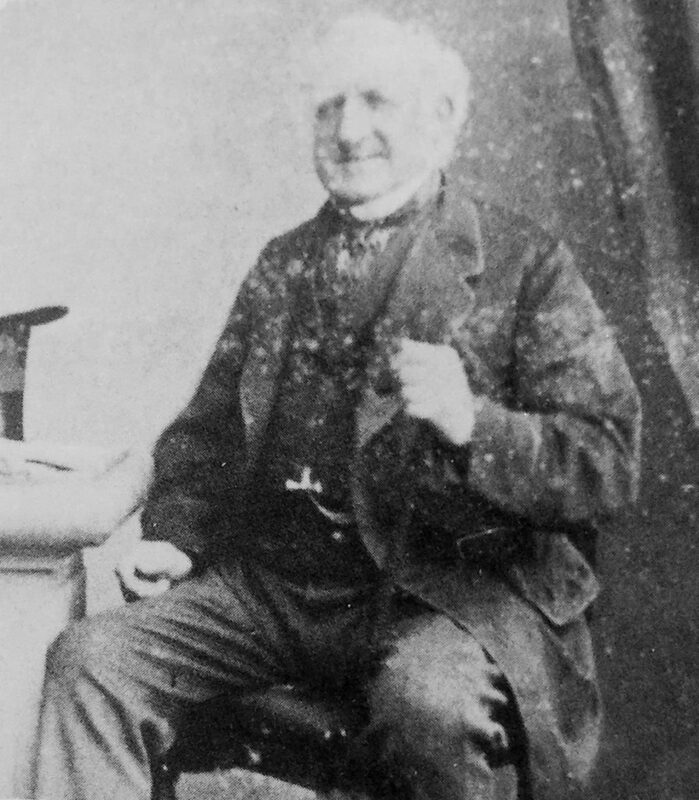 Their second son, John Dawson Duckett (2), named after his father, died on 2nd June 1841 at Bath, England aged 14 years . They also had three daughters, Eliza Dawson Duckett (Elizabeth) who died on 1st February 1839 aged 18 years, Sarah Duckett died in Dublin on March 12th 1879 aged 53. 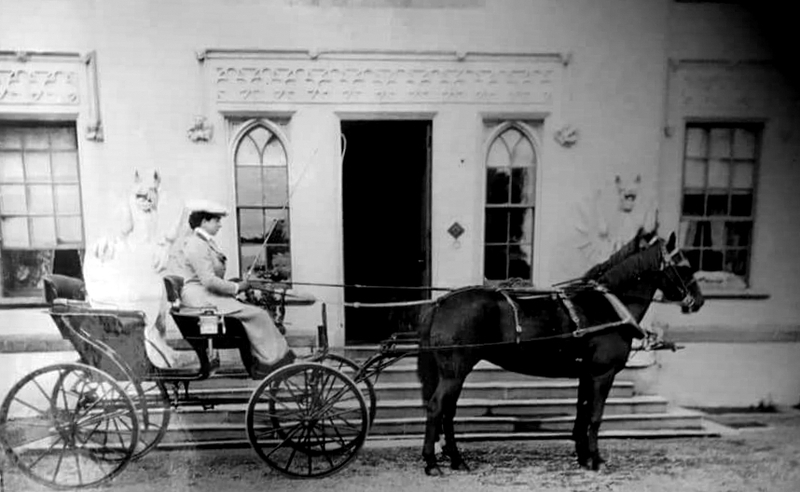 Their second daughter Anne Duckett married the wealthy Hardy Eustace of Castlemore in Tullow. John Dawson-Duckett (1) died on September 27th, 1866, at the age of 75. His son, William (Dawson) Duckett (2) became heir of Duckett’s Grove and did not marry until he was 44, when he married Anna Maria Morony, daughter of Thomas Harrison Morony, of Milltown house, Milltown Malbay, County Clare. The couple had no children and his wife Anna Maria Morony died in 1894. One year later William (Dawson) Duckett (2) at the age of 73 years married 21 year old Maria Georgina Thomson in 1895. “The William Duckett Stewart in question being a first cousin of William (Dawson) Duckett (2). The following gives an insight into just how well known, wealthy and liked the family were at the time: 7th September 1901. “We are glad to be able to record the safe return and in robust health or Mr. William Duckett-Stewart from South Africa, where he served for a lengthy period with the Imperial Yeomanry. Mr. Duckett’s return was celebrated on Wednesday evening last in a very marked and friendly manner. An immense bonfire was lit on the fair green in front of the entrance gates to the family mansion, round which the villagers and their friends gathered. Dancing and refreshments were enjoyed until midnight by the throng of well-wishers, the local band playing a long and varied selection of music to the delight of the listeners. In the house, the large party who came to join in the welcome and to congratulate the hero of the evening was entertained to supper. The weather proved very favourable to the reunion and the rejoicings included a good display of fireworks, managed very ably by Messrs Belton & Co. of Carlow. The house party included Captain, Mr. and Miss Duckett Stewart, Mrs. W.B. Persse, Mr. Kennedy RM, Reverend J. Coyle, PP. Capt. and Mrs. Thomas and party, Mr. and Mrs. Fitzmaurice and party, Mr. and Mrs. Vigors and party. Mr. Duckett-Stewart, on his appearance, was voicefouresly cheered and on his returning thanks to his well-wishers, the cheering was renewed and the best of good wishes expressed for his future welfare.” (sic). William (Dawson) Duckett (2) now had a new wife Maria and a stepdaughter Olive. He didn’t live that long afterwards, as he died in 1908, aged 86. He was the last member of the Duckett family line to live in Duckett’s Grove Gothic Mansion, in Kneestown, Carlow, leaving just his wife Maria and her daughter living there after his death. They spent the years between 1908 and 1916 moving between their houses in London and Dublin where William (Dawson) Duckett 2 had purchased a mansion on Raglan Road, called De Wyndesore, as a wedding gift for his wife Marie Georgina Thompson. When her daughter Olive married Captain Edward Stamer O’Grady in 1916, Maria decided to live in Dublin on a permanent basis. In 1921, during the Irish War of Independence in Ireland, Maria decided that it would be in her best interest to sell the Duckett’s Grove Mansion and move to England after receiving a threatening letter which were allegedly sent from members of the republican movement Sinn Féin. Some historians now believe it was sent from some of the local people who were disgruntle and had become malicious in their feelings towards the landlord system that had ruled them for so long. Maria Duckett lived in England until 1928, when she felt safe enough to return back to her house in Dublin. However, by this time she was suffering from a chronic psychological disorder which created a lot of problems for her, including overwhelming feelings of paranoia, believing everyone and members of the Roman Catholic Church in particular were “out to get her”. Her living conditions were described as appalling and squalid, and she was placed in a mental institution in 1935 where she lived out the final years of her life, until her death in 1937, at the age of 86. William (Dawson) Duckett 2. – The last of the Duckett blood line to live at Duckett’s Grove. The last living person to have a claim to the Duckett wealth was Olive, Maria’s daughter and William (Dawson) Duckett’s (2) stepdaughter. However, there was a major problem. Maria had left her daughter only one shilling in her last Will and Testament out of an estate valued at £97,735 stating in her Will: “My daughter Olive, be it clearly understood, is cut off to a shilling. Had she been an ordinary, good daughter, she would have had all she could have wished for…. She was amply provided for in her stepfather William’s Will.” Olive did not accept this, and she claimed that her mother was not of sound mind at the time of writing the Will, and that she was in fact entitled to more than one shilling. Sadly for her, the judge declared in 1939 that “the Will was legitimate, and that was the final word on the matter.” In accordance with the Last Will and Testament of Maria Duckett, the money was donated to various charities, under the condition that they were British based and Protestant. In the early 1900’s the Duckett family in Kneestown, Co. Carlow came to an indignant demise with no blood heir to the estate. A magnificent house which had been the Duckett family home and a demesne which once encompassed twelve thousand acres spread across five counties and had given employment to many people and where dinners, celebrations, tea parties, hunt balls were held, and where royal visitors had been entertained now stands abandoned and in ruins. Happier days were now distant memories for Olive Thompson Duckett O’Grady, taking nothing with her only memories and the ’bitter shilling’. One can only imagine her mixed emotions as she slammed shut the doors of a major chapter in her life and what was her home for so many years, leaving behind haunting echos ringing throughout the vastness of a now silent and empty mansion. Today, Duckett’s Grove, stands majestically in the rural landscape of Kneestown, Co. Carlow, deafened by the sound of silence that haunts the corridors of a house that once was a magical fairytale.